Do you love hosting a family game night? Then you'll love Hasbro's Annual Fun and Game Event which is going on right now! I wanted to share this with my US readers since I am sure most of you love boardgames as much as I do. I'm hoping they will have an event like this soon for Canada because it sounds great. 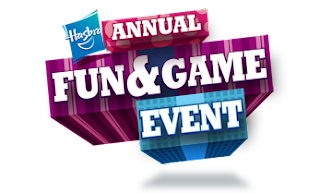 You can register for Hasbro's Annual Fun and Game Event for a chance to print over $125 in coupons (quantities are limited) and get access to incredible daily deals. All daily deals include free shipping. Stay tuned for my review of some really fun Hasbro board games such as Connect 4 Launchers, Cars 2 Frustration, Cars 2 Operation and Simon Flash.